Ireland (read Northern Ireland) has had a sweet and sour relationship with lottery that predates Irish lotto and goes back to the heady days of Irish Sweepstakes during the 30s. A lot happened in the fifty years spanning the sweepstakes of the 1930s and the first draw of the ‘An Crannchur Naisiunta’-the Irish Lotto- held in 1988 on 16th April. The early raffles editions became notorious for scandals rather than the triumphs as an accountant outwitted the National Lottery system, and raked in millions. Though lottery games in Ireland have been played for centuries, the sweepstakes started to gather steam following the nation’s independence that ushered in the prevalence of ‘Irish Hospital Sweepstakes.’ Modern Irish lotto history can be traced back to the 1930s when Ireland was nursing its wounds in the aftermath of the civil war. The entire nation was plunged into an abyss of crisis that was further exacerbated by the ‘Great Depression’. In order to finance the construction of hospitals on a war footing, “The Sweeps” (the popular name of Irish Hospital Sweepstakes) was established. Coupons of The Sweeps were sold globally, (albeit illegally), inspiring black marketers which infuriated the Americans. Illegal sale of tickets culminated in scandals that eventually led to the sweepstakes’ being called off for good. The Irish Government decided to replace the scandal-pockmarked Sweeps with Irish Lotto that would be strictly regulated. And thus was born the ‘An Crannchur Naisiunta’ in 1987 with the first flagship drawing game being organized on 23rd March of that year. The chief sweepstake was preceded by scratchcard games, including Windfall and Match 3. Not only were the games very elementary but even the purses were run-off-the-mill in comparison to what players scoop up nowadays. Nevertheless, the early editions were a hit with the public as huge ticket sales corroborated the masses’ infatuation with the lottery games. 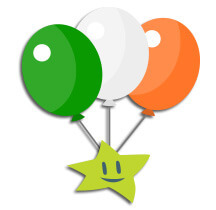 The Republic of Ireland’s state lottery is known as ‘National Lottery’ (‘An Crannchur Naisiunta’ in Irish). The Irish Lotto or National Lottery was incorporated was incorporated by the Irish government via the ‘National Lottery Act 1986’. The debut drawing was organized in 1987 on 23rd March and players used scratchcards for participating in the sweepstake. The first Irish Lotto organized in 1988 on 16th April coincided with some landmark events that took place in that same year. Communism was on the verge of collapse and Republic of Ireland had for the first time qualified for the European Cup. The 16th April drawing turned out to be incredibly contagious as players on either side of the border between Republic of Ireland and Northern Ireland, participated. Till 30th May 1990, the draw was held only once weekly on a Saturday. On and from 30th May of that year, a draw was introduced that was to be organized every Wednesday. Since that date, sweepstakes took place only twice in a week and continue to. Since the odds of winning the Irish Lotto jackpot were 1 in 1, 947, 792 (not high enough going by top prizes’ standards), one just needed to invest £973,896 to buy tickets containing all the possible combinations. The investor by purchasing coupons bearing all the probable number combinations was almost guaranteed to win the jackpot. This technicality made the National Lottery sweepstake susceptible to be sabotaged by an investor or syndicate with deep pockets. And it actually happened in 1992 on 30th May when Stefan Klincewicz, a Polish-Irish magnate formed a 28-member syndicate to buy coupons en masse, containing all conceivable number combinations. The organizer of National Lottery took all possible measures to outwit the syndicate but the latter somehow succeeded in purchasing more than 80% of the ticket combinations. Klincewicz made a killing, earning a gross profit of about £310, 000. His winnings inspired him to write and publish a tome titled, ‘Win the Lotto’. National Lottery, in order to thwart such premeditated sabotages in the future, kept on augmenting the odds of pocketing the jackpot. (Similiar article about mathematician lottery winners) It added 3 extra balls to the lottery machine that originally contained 36 spheres in 1992 and continued adding 3 balls in 1994, 2006, and 2015 respectively. A typical player who bought an Irish Lotto coupon from and 3rd September 2015 onwards had a one in about 10.7 million chances to corner the top prize amounting to €2 million. The flagship or the chief drawing game of National Lottery is Lotto. In its present format, the winning ticket must match all six numbers picked up from a total 47 numbered balls and the ‘bonus ball’. One has to invest a minimum of €4 to purchase an Irish Lotto ticket imprinted with two sets of six numbers. The National Lottery currently supervises three distinct drawing game categories viz. ‘Lotto’, ‘EuroMillions’, and ‘Daily Million’. The state sweepstake operator also organizes televised game shows, runs yearly Millionaire Raffles, and retails the variety of scratch cards. One can buy a ticket from any of the more than 3,700 retailers countrywide or purchase slips online by logging in at the official site of ‘National Lottery’. 16th April 1988: The first flagship draw of Irish Lotto is held. 30th May 1992: An extra draw (besides the original Saturday draw) is introduced. Stefan Klincewicz forms a syndicate in Dublin for purchasing tickets in bulk printed with all possible number combinations, and earn profit exceeding IR£300, 000. 22nd August 1992: The first draw consisting of 39 balls is organized as well as a bonus ball is introduced that leads to creation of three additional prize layers. 31st July 2005: Dolores McNamara, a cleaner from Limerick pockets a whopping €115 million EuroMillions jackpot and becomes Ireland’s luckiest (read biggest) lottery winner. 28th June 2008: A 16-member syndicate from Carlow County wins €18.9 million. This is the largest ever Irish Lotto jackpot amount to be won and the record still stands. Winning the top purse of Irish Lotto has become harder over the years as the total number of balls in the draw pool has increased from 36 to 47. However, the jackpot purse to be won has also subsequently burgeoned remarkably that entices millions of Irish men and women to continue trying their luck. Hi lottery fans i was a poor man who had never find luck when it comes playing lottery. i have been playing lottery since my early 20s and now i am 48 years. One day my story turns into history after i found a man from lottery blog, And it says he’s the best when it comes to winning lottery. This man is a very strong voodoo doc who gives out the numbers that can never be complicated. After all my years of laboring and struggling to win the lottery i finally won £750, 000…. isn’t that interesting?? if you are a lottery fan and you need to win you can send him email right now marvelspelltemple@gmail. com his contact Check….